If you are reading this, you must considering a temporarily relocation of your mailing address to the Black Rock desert with the Mikimau family for the 2016 Mikimau Burningman experience. 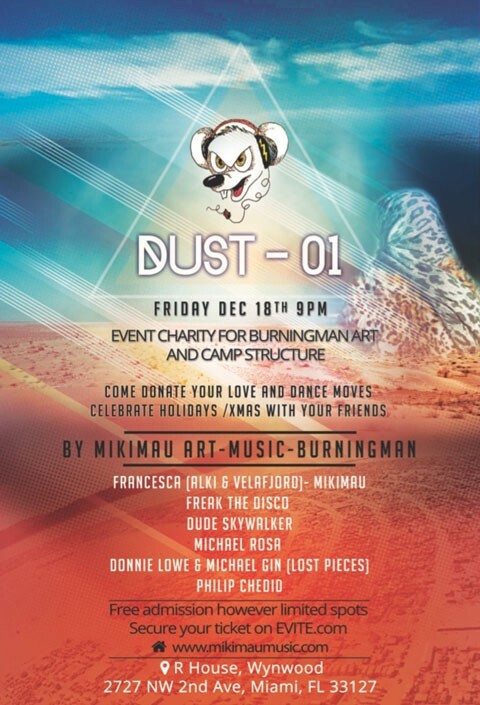 Dust 01 is one of the first events dedicated to the Miami Burmingman community, the goal is to spread our believes and love through art and music and create a strong bridge to bring local artist to Burningman. We aim to raise funds towards making our next year’s affair extraordinary and to bring local artists together to help us create art that will decorate our camp. 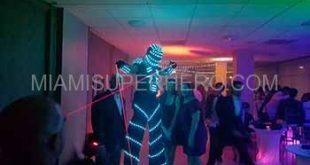 Your monetary contributions, more specifically, will help us in the creation of our communal areas including dance floor, sound system, art installations, shower, evaporation systems, kitchen, and lounge area. There will be different mediums and paint provided for you let your creative side shine if you wish. If you are undecided about joining in the dust next year and are just looking to for a good time, you are guaranteed a night of lip-biting music, a carefree atmosphere and meeting fascinating people. Everyone is welcomed. The act of gift giving is one of Burning Man’s ten core principles. It is a reflection of our community’s culture on and off the playa. Gifting has been the source of delight, wonder and happiness and it bonds our community together. Donation will go to support the Year-Round community at burningman.org which helps art structures and artists at Black rock city. Next Acupuncture: Does it really work ?